Hi friends! It's Sunday afternoon and I'm working on our evening meal-- a huge meatloaf, turnip greens, fried grit cakes drizzled with maple syrup, and cantaloupe. Different days this week, I'll post a different recipe and details of each dish, starting with the turnip greens today. 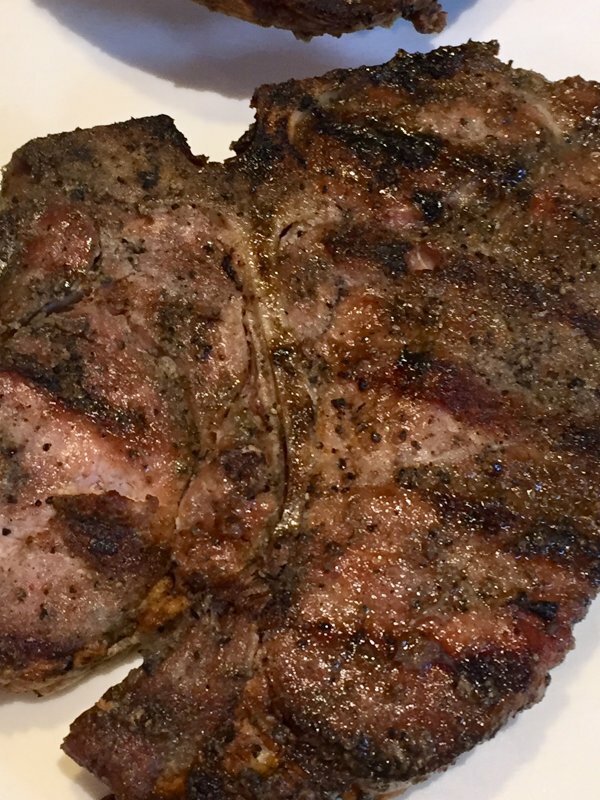 But, yesterday evening we had grilled pork chops, and hubby left them on the grill just a little longer than we would have liked, so they were a tad dry. We had a lot of them too, so I was thinking of some way to use them so that they didn't end up thrown out. 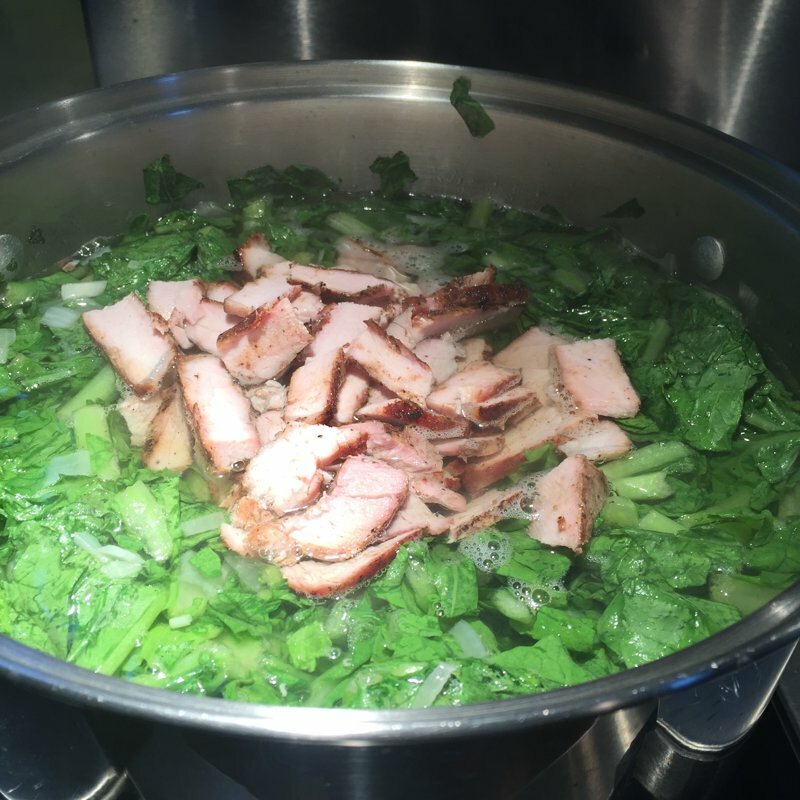 They were perfectly seasoned and I got to thinking that they would be good cut into very thin strips (across the grain) and added to the turnip greens instead of the usual salt pork that I would normally use for seasoning. 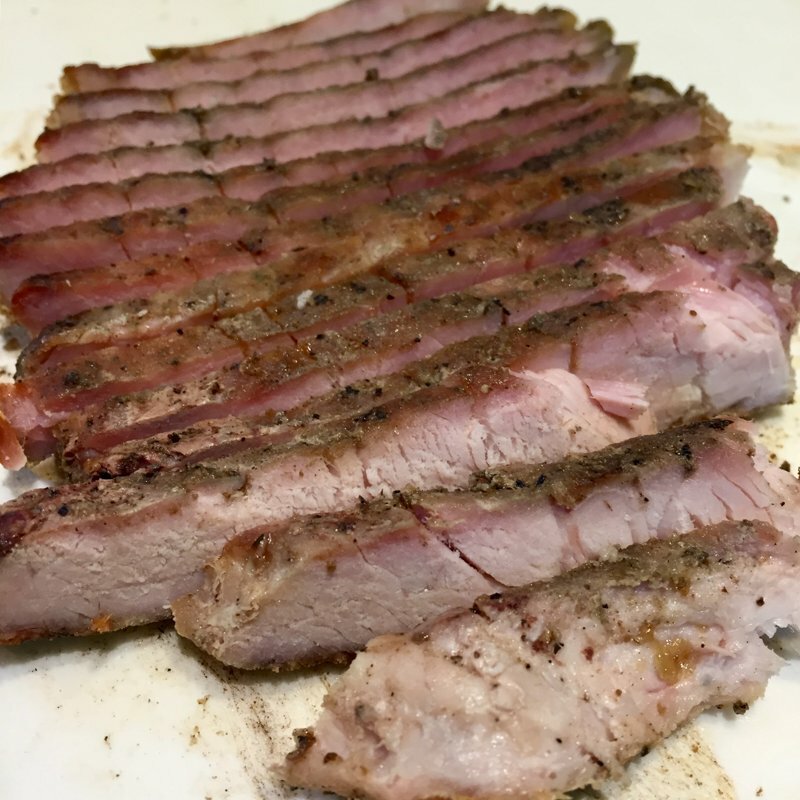 It should impart a nice smoky flavor along with the actual seasonings that I had used on the pork chops before they were grilled. So, with that in mind, I'll show you what I did! Of course, I don't trust the "triple washed" thing, so I washed them again--a couple of times. I added them to a large pot and filled with water. Turned on the flame and got them to cooking. 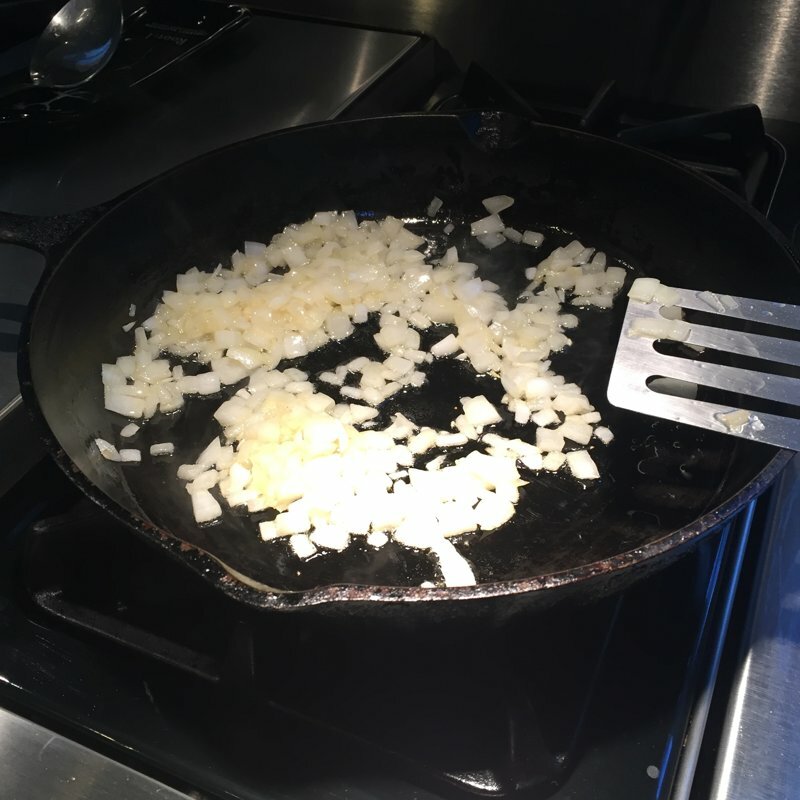 At the same time, in my trusty iron skillet, using a couple teaspoons light olive oil, I sauteed one sweet onion, until translucent, a total of about five minutes. During the last couple of minutes, I added a tablespoon of butter flavored olive oil spread for a little more flavor. Once finished, I added the cooked onion to the pot of turnip greens. 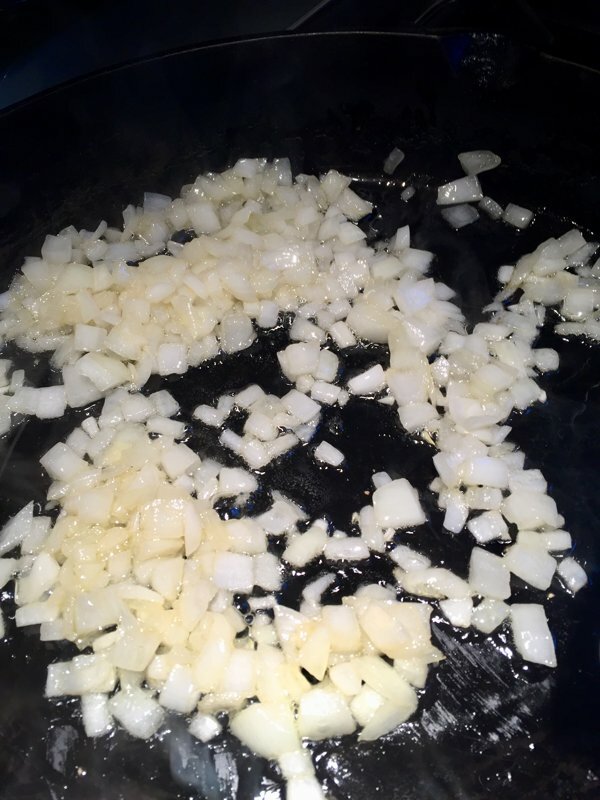 You can see all the seasoning in the middle picture above. Yum! I used Daddy D's Steak Seasoning (Shoutout to my friend, Dwight Griffin, of Daddy D's!) already contains salt, so in case you noticed that I didn't add salt to my water, that's the reason why...don't want to oversalt it. Salt can always be added when it's served, if needed. Now, they just need to simmer for a couple of hours. Not sure how they'll taste yet, but hubby just came in from outside and said that the house smells really good! I think that's a good sign, don't you? Well, we've finished dinner, and I forgot to post, so here I am the day after about to eat some leftover greens! They were great, but did need a little more salt. Even though they were fine as they were, here in "the South" we seem to always add a little something more. In this case, we grabbed the hot pepper sauce and some sweet/hot pickles to offer some complementing options. Next post will be the grit cakes. Hope you'll join me again! Welcome to What's Cooking at Pimperl Place! 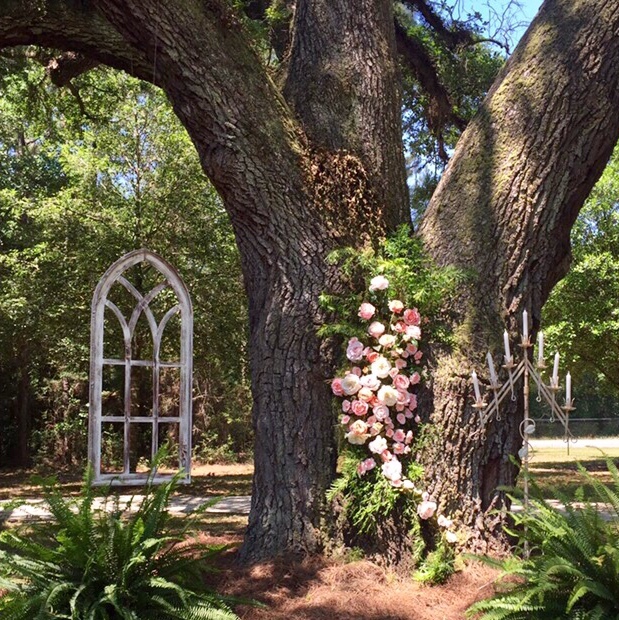 Pimperl Place is a gorgeous outdoor wedding venue in North Baldwin County, Alabama. Please click on "Weddings" to see what we have to offer!